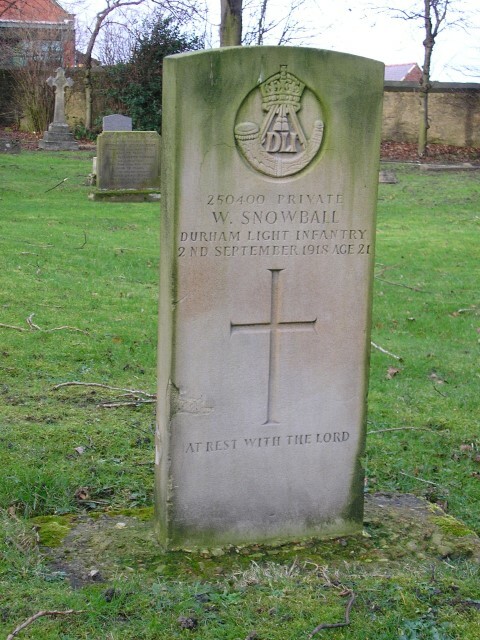 250400 Private Walter Snowball, 6th Battalion, the Durham Light Infantry died 29 August 1918 and is buried in Evenwood Cemetery. He was 21 years old and is commemorated on the Evenwood War Memorial and the Roll of Honour, St. Paul’s Church, Evenwood. 27 February 1915, as an 18 year old Walter Snowball enlisted into the 6th battalion, the Durham Light Infantry, his local territorial battalion and was given the regimental number 6/3470. Private Walter Snowball entered France 7 July 1916 and returned home 17 January 1917. He later was allocated the regimental number 250400. Walter Snowball was discharged 19 July 1917, being no longer physically fit for War Service. 27 February 1915, Walter was aged 18 years 6 months underwent a medical inspection. He stood 5’3” tall and of good physical development and good vision. A second examination 21 July 1915 stated that his physical development was poor nevertheless he was accepted considered fit for service. 10 January 1916 Private W. Snowball was sent to an isolation hospital with scabies (a skin condition). 17 January he was transferred to Wheatley Hill Military Hospital diagnosed with dyspepsia (impaired digestion). He was discharged 25 January only to be re-admitted on the 10 February for 11 days with bronchitis. Private W. Snowball entered France 7 July 1916 and was admitted 18 January 1917 to Northumberland War Hospital, Gosforth, Newcastle upon Tyne. He was suffering from nephritis (a kidney complaint). Private W. Snowball was discharged from the Army 19 July 1917. Private Walter Snowdon was in France between the 7 July 1916 and 16 January 1917 so it is assumed that he was involved in action on the Somme. It is assumed that Private Walter Snowball Saw action here. 250440 Private Oliver Rushford MM, 1/6 DLI was killed in action 30 May 1918 and is commemorated on the Soissons Memorial, France. 131539 Sapper Herbert Wardle, MM, 234th Field Company Royal Engineers was killed in action 31 July 1917 and is buried at New Irish Farm, Ypres, Belgium. The 3 DLI Battalions took over the front line positions and the 1/5th Borders came up behind them as the reserve battalion. The 1/6 DLI was a battalion recruited mainly in Bishop Auckland and the upper valley of the river Wear, who to the rest of the D.L.I. were known as the “black-buttoned bastards”. The 1/6 DLI was in the centre of the line. The 1/8 DLI was to the right and the 1/9 DLI, known as the “Gateshead Ghurkhas” were to the left. Together they would attack the Butte 5 November 1916. It is assumed that Private W. Snowball took part in this attack. 1/9 DLI was charged with capturing the Butte and a quarry beside its west face. 1/6 DLI and 1/8 DLI were to seize the Gird Trench and Gird Support Trenches. The 28th Australian Division was to attack alongside 8/DLI. In support, to the right were the 1/4th Northumberland Fusiliers, to the left, the 1/6th NF and the 1/5th Border Regiment was in reserve. The Durhams went over the top – with mud high above their knees, wading, slipping, stumbling and falling forward, laden with the usual infantry equipment necessary for such an attack (rifle, packs, grenades, entrenching tool, pick, Lewis gun drums) – it was worse than they could ever have imagined. On the right the 1/8th was badly hit by a combination of both German shell fire and British shells dropping short. They were even hit from behind by their own long range machine gun barrage that was meant to be supporting them! Many men had difficulty getting out of the trench and needed assistance from their mates – all under heavy fire. Despite this, the left of the line managed to get within 30 yards of the Butte before they were overwhelmed. The few survivors fell back in disarray to their original front line. The only success came on the left where the 1/9 DLI directly faced the Butte. Why this should have been is unclear but they swept up and over the Butte and by 10.00 the Durhams grabbed most of the low mound and the surrounding trenches, including the German front line trench, Gird trench. But the first German counter attack commenced at about 12.00. Bombing attacks then hand to hand fighting took place. The 1/9 DLI were entirely cut off from any reinforcements by the accurate German artillery fire and well directed machine gun fire. As their numbers gradually dwindled, they fell back from their advanced position around the Butte to Butte Alley to where the 1/6 DLI had its bloc. Despite the desperate need for assistance, they hung on until 18.00 when the enemy launched another determined counter attack preceded by a terrific bombardment. Yet more German reinforcements appeared, hand to hand fighting and bayonet charges bit deep, the exhausted Durhams had been fighting all day with no respite. Retreat had become inevitable and the precious gains of the morning were lost to the German counter attack. After hard fighting, the Germans were held back and so, after a day of drama and death, the situation was exactly as it had been before they started. On the evening of 6 November, they were relieved by the 1/5 DLI who formed part of the 150th Brigade. It should be noted that “missing” usually meant dead and some of the wounded would die. In any event, almost 1000 casualties brought misery to many Durham homes! 1672 Private Alfred Brown 1/6 DLI from Staindrop and is buried at grave reference VIII.B.7 Warlencourt British Cemetery. 2211 Corporal Ralph Hebdon, 1/6 DLI from Tindale Crescent and buried at Warlencourt British Cemetery grave reference VIII.B.6. 2264 Corporal George H. Smith 1/6 DLI from Barnard Castle, he has no known grave and is commemorated on the Thiepval Memorial. 3472 Corporal George Thomas Cox, 1/6 DLI from Evenwood, he has no known grave and is commemorated on the Thiepval Memorial. 3124 Private Robert Wilson, 1/6 DLI from West Auckland, he has no known grave and commemorated on the Thiepval Memorial. No doubt in such close communities as they were in south west Durham, perhaps these men were known to each other. Watson reached up to take the gun from the trench, turned round and found his solitary gunner Pte. McRoberts holding a revolver in the ribs of a Prussian Guardsman who had somehow found his way to the rear of the machine-gun post. So why had the Durhams failed? Perhaps Brigadier General Hugh Tudor and Lieutenant Colonel Roland Bradford had the answers. The newspapers talked about “the Miniature Gibraltar”. It was a local operation, so costly and rarely worthwhile. Sadly, actions like the attack of the 151st Brigade on the Butte de Warlencourt on the 5th November 1916 had no real importance within the context of the Somme offensive. This kind of attack achieved nothing but swollen casualty lists. Any change in tactics would be too late for the gallant Durhams. The scene in this painting is somewhat different – a white mound looming from the surrounding muddy morass. The scene today is of an agricultural landscape and when visited in March 2007, the Butte was an isolated wooded area amongst ploughed fields, its military significance unrecognisable other than the memorial that stands there. The Warlencourt British Cemetery lies some 300 yards or so to the west along the road leading to Bapaume. Private Walter Snowball returned to England after 194 days on the Western Front. Soon after his ordeal at the Butte de Warlencourt, 18 January 1917, he was admitted into the Northumberland War Hospital, Gosforth, Newcastle-upon-Tyne suffering from nephritis (a kidney complaint). He was examined by the Medical Board. 28 June 1917 it was considered that he was “quite unfit for Military Service”. The Board concluded that he was physically unfit and the illness, nephritis was not the result of Active Service but aggravated by the cold and exposure whilst on Active Service. The report also stated that “no treatment was required” and it appears that a 50% pension was awarded. Private Walter Snowball was discharged from the Army 19 July 1917. Private Walter Snowball died 29 August 1918. He was awarded the British War and Victory medals. “The Somme” P. Hart & CWGC details. CWGC date is 29 August 1918. His headstone records 2 September 1918 as the date of death.